Who can forget the line uttered by Julius Caesar, ‘E tu Brutus’? His shock and anguish at the backstabbing by a trusted friend is very visible in the line. Though Caesar was literally stabbed, at the modern workplace, you can find many who do that figuratively. They may badmouth you or break your trust. They may even try to spread a gossip about you on something that you must have shared personally. Backstabbing co-workers are a reality in all kinds of workspaces. The more efficient or the more you are liked in your office, the more are the number of backstabbers. Corporate jobs are a dream for most of the people. There are many individuals who try hard to gain a job in the corporate market as the advantages that come along with it are huge. But one should also have an idea about the other side of the corporate world, the negative sides like Office politics, backstabbing etc. “Backstabbing is something most people will have to deal with at some point“, says Diane Domeyer, executive director of The Creative Group. This not only happens in corporate but you can also see it everywhere, whether its a mid-sized company or any startup. The only thing you can do is to identify such employee and stay away from them. How to Respond to Backstabbing? Every employee in his career faces backstabbing kind of issue at least once. If you are not one of them then, you must be lucky enough to have good colleagues around you. Identifying workplace saboteurs is the primary and initial thing that you should do. Here are a few steps you need to follow in this process. 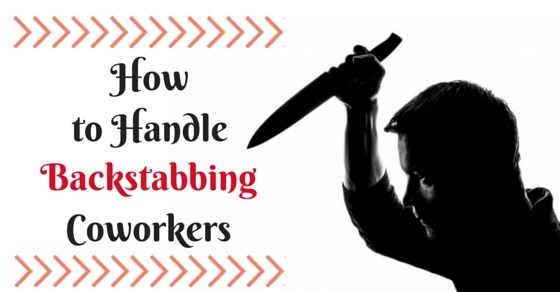 How to Deal with Backstabbing Employees? Avoiding such people or employees and maintaining a distance is the best and only solution if you need to deal with backstabbing employees. Trustworthy employees are like a boon for other colleagues and the company, whereas untrustworthy employees acts as a hindrance on the way to success. Workforce acts an imperial role in achieving company goals and vision. Let’s discuss few signs that help you locate an untrustworthy employee easily. At the workplace, beware what you are talking about or what information you are sharing. When a co-worker shows too much interest in your personal matter or your opinion about another colleague at work, refrain from being honest. In fact, avoid such questions with a smile. Take care not to divulge any ideas that you have about a project you are handling with a colleague who is a backstabber. Disclose your ideas only in the presence of a superior. You can even request your boss to divide project responsibilities so that you get the credit for what you have put in. When there is a sudden change in the office or there are rumours about firing some, be extra alert because it is during such situations that people try to pull down others just to protect their position. At such times, just avoid talking too many personal or professional matters with anyone. The first stage utilised by backstabbers is essentially the sweet one. They may try to befriend you and say nasty stories about a colleague that you dislike. Do not encourage such sessions and just do not add fuel to the fire. Whatever you may say can be used to get back at you. Whatever happens or whatever way, the backstabbers might try to incite you, so remain calm. Avoid them as far as possible. They may whisper into each other’s ears looking at you or they will smile sarcastically while you are passing. Remember by doing all these, they want you to react and attack them. Don’t fall into their trap. Giving away physically or emotionally won’t solve your problems. Talk to your family or close friends about the situation. Their words of support will act as armour against bullies. Remind yourself that you are talented and a valued employee and that is the reason why these backstabbers are behaving the way they do. So smile and keep your distance. Have caring co-workers at your side. Talk to them on all topics but never broach any topic concerning the backstabbers. Talk about fun things, laugh and have fun. Backstabbers will automatically retreat when they see that you are not intimidated but are having fun. React only when a problem escalates and that too in a way that is calm and restrained. When you become aggressive, lose temper and shout at the backstabbers, you are also becoming a part of the problem and you will not be able to sort out the situation. Hence when you confront, do so with dignity and self-restraint. No matter how much some backstabbing co-workers are trying to belittle you or are spreading rumours about you, you should focus on your work and try to become better at your job. Go beyond the call of duty and put in your best. Just concentrating on your work will be able to put the stress and such people away. Whenever you have to communicate to such co-workers, instead of verbal communication, send e-mails. If they are rude to you in any work matters, tell them to send the details and reasons by mail rather than informing you verbally. Keep note of all your work, your project details and meetings. Be extra careful and cautious so that whenever any allegation is made against you, you have evidence to prove that they are wrong. Though you should not be a part of office politics, you should know what is going around. The key here is to listen to gossips but do not spread them. Maintaining a ‘holier than thou’ attitude only makes you more distant even from others, which will give the backstabbers an upper hand. If you get a chance to help someone or guide a newbie, do that. Even if one of the backstabbing colleagues come asking for a help, try to help them out. These helping gestures will put you in a favourable situation and secure from any harm that these people might try to impose. This is a trait that will come only with practice. Learn to read non-verbal communication and study people. When you are good at reading people, you will automatically save yourself from backstabbers. Be it professional matters or personal matters, when you communicate with backstabbing co-workers, then stick to either single words or one-liners. In this way, neither are you snapping at them nor are you encouraging them. Whenever you are dealing with such colleagues professionally, be shrewd and extra cautious. Check and do follow-ups. For example, if you have to hand over important files to them, then take a receipt note from them, or hand it at the presence of a witness. If you have to email an important note, send a Cc to another colleague in the department. Be strong in front of the backstabbers. Even if you feel bad about what’s happening or you feel anxious about how the next day would be, do not express it. Display a stronger exterior and go about your work quietly and more effectively whenever possible. Try to find information on the activities of the backstabbers discreetly and gather all the evidences you need one by one so that when things go out of control, and you need to stand up to these bullies, you are prepared and you have the proof ready. Gather whoever you can around you. Let these people be those who you trust well. Give them an idea about what’s happening. Hence when lies or rumours are spread about you, these people will know the truth and they will be of help. The backstabbers are not easy people, they know all the tricks of the trade. Most of them have deep issues. Never underestimate them. Do not take their actions lightly and be aware of them at every step. Know what they are up to and devise ways to be on the safer side. If the backstabber is spreading rumours about you or has told some colleague that you do not like him or her, then go to the person directly and try to talk it out. Also, confront the rumours and if anything can be amended, do it. And the ones which you can’t help, ignore. Sometimes you may get tempted to badmouth about backstabbers to others or try to do nasty things to them. If you will resort to these things, what will be the difference between you and them? Hold your dignity and go about your work, with a smile and a cheerful attitude. Anybody can be a backstabber. Nobody is born with such an attitude. A person ready to stab you in the back can be the sweet intern or the person who diligently wishes you every morning or even the one sitting next to you with whom you share lunch and jokes. The moral is not to trust anyone completely and consider only those as friends who you have tried and tested. Confrontation is not all about fighting it out physically. You can confront a wrong doer in a non-violent way too. If you have all the evidence with you, then you can take your boss or a HR representative with you. Put the proof before him and ask him politely the reason of his behaviour. Take the matter to your boss only when all other solutions do not work. But before you present the matter to your boss, try out all the above points. Keep proof ready and also see if any colleagues who know the truth, will speak in support. Tell your boss that you regard this as a small matter, you still want an amicable situation. You should create an impression that you are not complaining but since you need a cordial working atmosphere, this issue should be resolved in a friendly manner. If the boss does not stand by you, and the backstabbers succeed, don’t sit back blaming yourself. You know you were right so why bother? Start looking for a new job and say good bye cordially with dignity. Good things definitely happen to right people, believe that. You will find unethical people in all walks of life and especially at work, backstabbing co-workers are a reality. It is of no use, running away because the problem is going to persist. Hence it is important to learn to handle these backstabbers in an intelligent and smart manner. These steps will help you handle backstabbers in a dignified manner, a method that does not hurt but is impactful.